Cascable 3.6 (released in September 2018) introduced two advanced blocks to Recipes: Wait For Input and Move Focus. These blocks are very powerful, but require a more detailed understanding of how they work and how your camera works to get the most effective results. The Wait For Input block is similar to the Wait Fixed Duration and Wait Variable Duration blocks, except that it waits for input from a human before continuing. This can be very useful if you want to take a series of photos but need to manually change something about your scene in between shots. A very basic example would be the following recipe, which would cause the screen to the right to appear when the recipe runs. 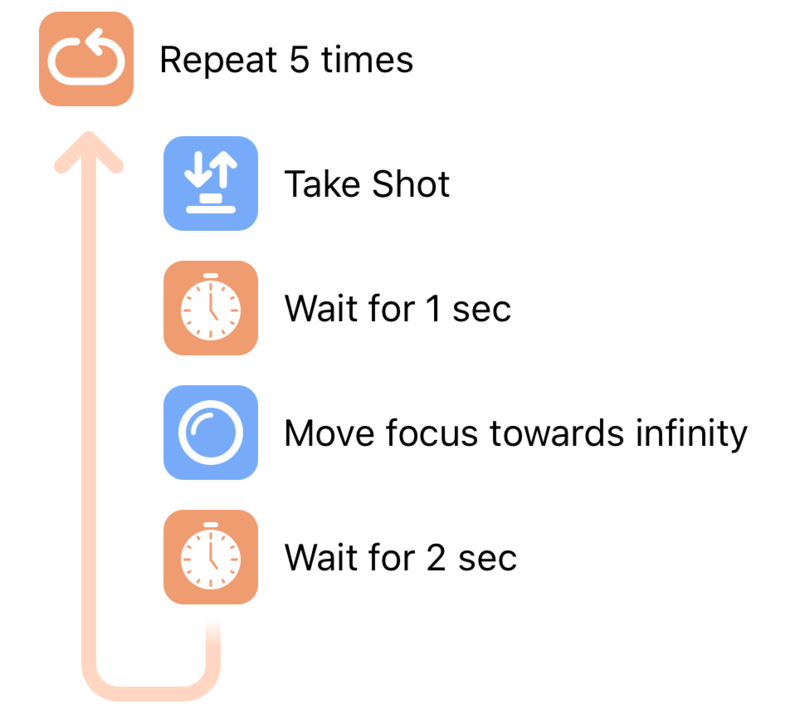 Tapping the Continue Recipe → button will cause the recipe to continue, taking a shot and repeating until Stop Recipe is pressed. The Message setting allows you to customise the message displayed on-screen when waiting for input. This message will also be transmitted to Bluetooth input accessories, which can also display the message if they have the ability. The Accessories can stop setting allows you to disable the ability for input accessories (USB and Bluetooth keyboards, as well as Cascable Recipe Input Bluetooth input accessories) to stop the recipe. Via the on-screen buttons on the iOS device running Cascable. The Space, Right Arrow, and Return keys will continue the recipe. If the Accessories can stop setting is enabled, the Escape key will stop the recipe. Via a connected Cascable Recipe Input Bluetooth accessory, including the Cascable Recipe Input app for iOS. 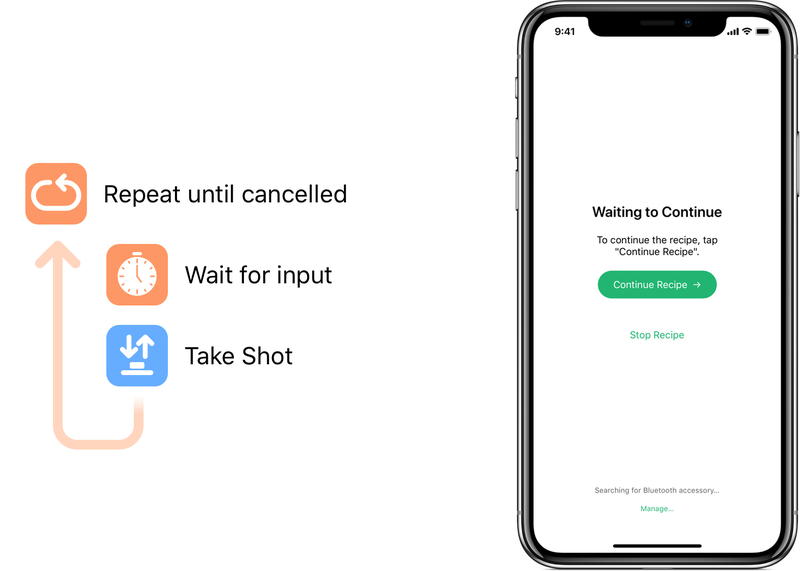 To connect to a Bluetooth accessory, when the Waiting to Continue screen is displayed while you’re running your recipe, tap the Manage… button at the bottom of the screen. Cascable will search for available accessories and attempt to connect to them. Once connected, you can use your Bluetooth accessory to provide remote input. If you have another iOS device, you can use our free Recipe Input app as a Bluetooth accessory. You can find it on the App Store. The Bluetooth protocol we use to provide input to Recipes is open source, and if you want to build your own custom integrations into Recipes, our Cascable Recipes: Basic User Input GitHub repository is a great place to start. It contains documentation of the protocol, example source code for iOS, Mac, and Windows 10 IoT, as well as instructions for building your own Raspberry Pi-powered Recipes input button. Important: Due to camera limitations, the Move Focus block is only supported by Canon and Nikon cameras! The Move Focus block is used to build recipes that directly manipulate the focus position of the connected camera, for example when performing focus stacking. When configuring the Move Focus block, there are two settings, Focus Direction and Focus Amount. Focus Direction can be Towards Camera or Towards Infinity (i.e., away from the camera). Focus Amount can be Small, Medium, or Large. The actual amount moved by each setting depends on the camera and the lens that’s attached to it. You’ll need to experiment with the settings to see which ones are best for your needs and equipment. The amount of time the camera takes to perform the move operation also depends on the camera and lens combination. Make sure you add a Wait Fixed Duration block after your Move Focus block to allow time for the focus to move. When executing a recipe that uses Move Focus, your camera needs to have autofocus switched on otherwise Cascable can’t control the focus position. This does sound a little strange, but with autofocus switched off the focus motors are completely disengaged and the only way to change the focus position is to manually turn the lens’ focus ring. When taking shots, make sure the Skip autofocus if able setting of your Take Shot blocks is switched on. If the camera performs autofocus, it will undo your hard work! For general help with Recipes, see the Shutter Robot Recipes: Quick Start article.